Every year, about this time, I ache for what I haven't accomplished. I ache that I haven't written nearly as much as I wanted to. That I haven't blogged, posted or set the time aside. The reality is, it takes a while to write. Especially to write well. (You know, with good grammar and all that.) For me, it's also emotionally draining. The writing that means most to me is most often visceral. It comes from a place of absolute reality. Not trying to gloss things over or not worry someone. It just is. Then, when what I write touches someone. Oh! That is the best thing that can happen. But most often it comes from those raw, painful posts--the ones that really matter. My next regret is that I have so, so much that I want to do. My vision of what I want to accomplish is enormous. So enormous, that I'm often afraid to begin. Because, you see, I might fail. So I fritter my time on Facebook or reading news articles. It's not bad stuff, the way I waste my time. But it's just enough to fill an hour here and 30 minutes there so that I can't research graduate schools I'm interested in. Or work on trying for scholarships. Or, writing a blog post. It's just enough time that I can't accomplish anything. Sometimes I think, "Oh the PTA or my calling or the kids' schedules are getting in the way. Perhaps if I did less..." But that's not really it. I have time that I lose. The other day a friend asked, "Are you choosing you?" That question has been haunting me. It's the question I ask when I don't eat the salad I really want because it will take too much time to put together. It's the question I ask when I want to read a book or research a topic. The reality is, I could choose me. I could choose to go after the degree, to write every day, to eat the salad, to study my scriptures with the depth I really want, to go to the temple. I could choose me. And that might produce guilt. And if that happens, then I *should* stop choosing me, and stop doing what I love and fail myself so that no one else at anytime felt failed by me. And yet, that would be a failing too. 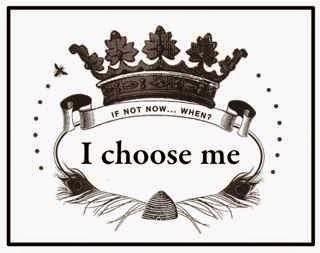 Because if I don't choose me, then my boys won't expect their wives to choose themselves and my girls won't have an example of choosing themselves--of having their hopes and dreams and desires matter. Just today I read a quote on Kat Lee's blog where she's quoting John Maxwell. She writes, "As Mr. Maxwell says in the book, 'Our ceiling is our children’s ground floor.' I want to push my personal growth as far as I can so that my children have the best start possible." So how do I choose me? And how can I not choose me?